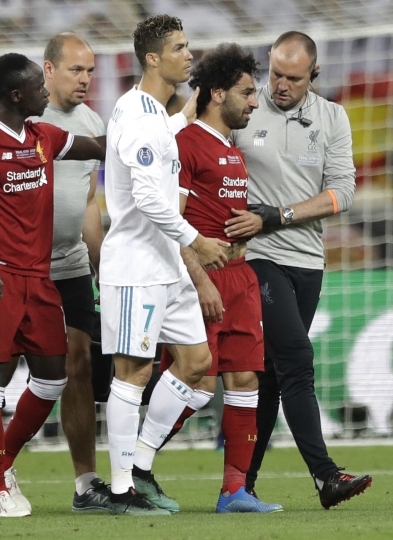 CAIRO — A heartbroken Egypt shared a rare moment of unity on Sunday: An outpouring of sympathy and love for Liverpool forward Mohamed Salah, and loathing for Real Madrid's Sergio Ramos. 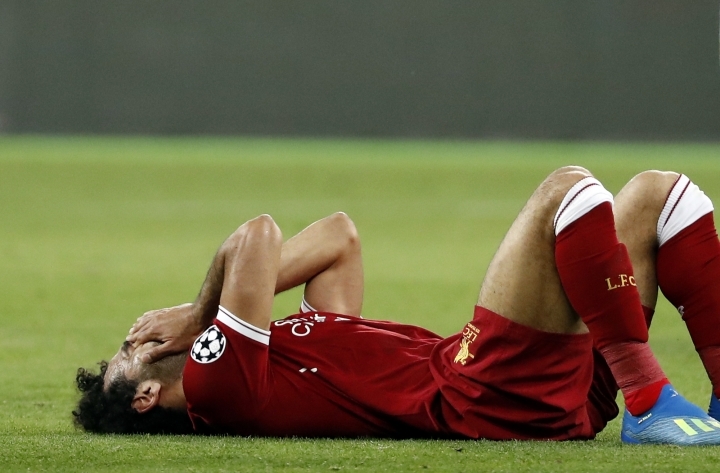 The defender was accused by many Egyptian fans in the soccer-crazy nation of deliberately injuring Salah in the Champions League final. 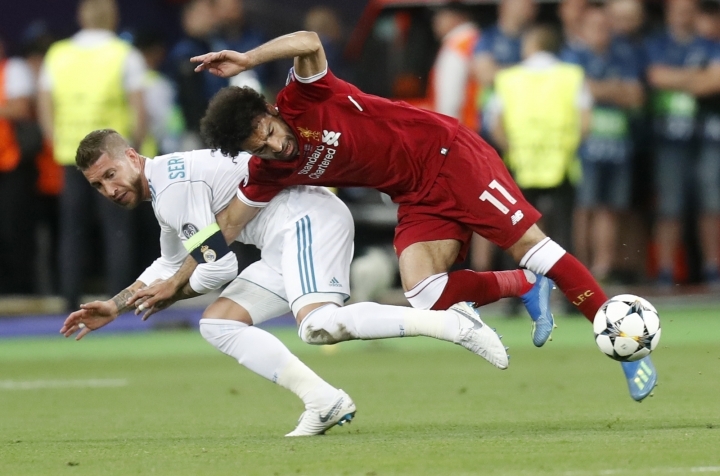 The Egypt forward was hurt Saturday when he tangled with Ramos, who grabbed Salah chasing the ball and held on to his right arm. 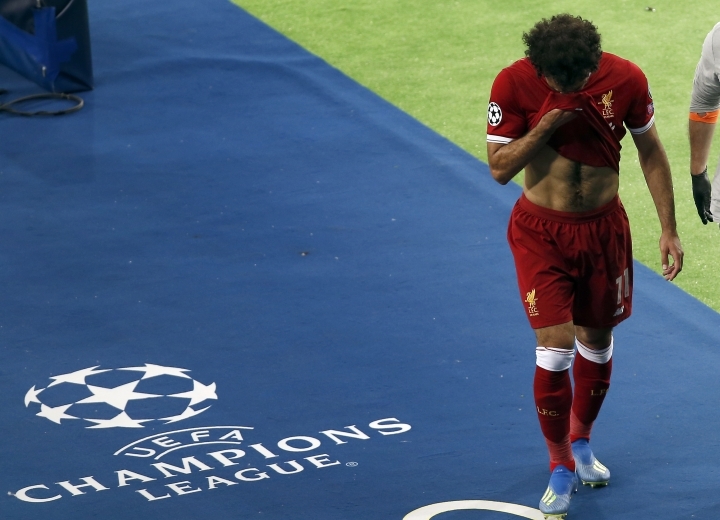 In their twisting fall, Salah landed heavily on his left shoulder and exited the match in Kiev, Ukraine, after just 30 minutes. Ramos, the Madrid captain, was not shown a yellow card and the Spanish powerhouse went on to win 3-1 for its third successive Champions League title. "Despite the odds, I'm confident that I'll be in Russia to make you all proud. Your love and support will give me the strength I need," Salah told fans in a tweet Sunday night. 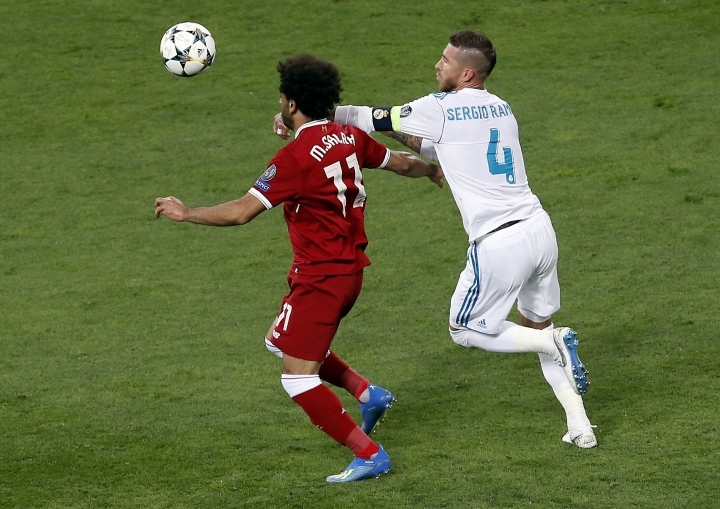 Ramos may have escaped punishment in Kiev, but it came swiftly in Egypt, where Salah's fans took to social media to vent their frustration, using the Arabic language's rich repertoire of expletives to insult the Madrid veteran. Some offered prayers, seeking divine intervention to exact revenge on the Spanish international. "This isn't football, this is wrestling. You're the world's dirtiest player," a Salah fan claimed in a tweet addressed to Ramos. In contrast, expressions of sympathy and support for Salah came from thousands of ordinary Egyptians, celebrities and the country's president. "My heartfelt wishes for the Egyptian hero Mohamed Salah to recover from his injury, and I hope he will return to the field soon and remain a shining Egyptian star," President Abdel-Fattah el-Sissi tweeted. "No matter what happens, we love you and you'll never walk alone," a Salah fan wrote on Twitter, playing on Liverpool's storied motto. Another one said: "Though you weren't there to win the match, you definitely won our hearts. We love you." But maybe the depth of the love for Salah came from the tweet of a young man who had been imprisoned for 26 months in Egypt for simply wearing a T-shirt emblazoned with the words "a nation without torture." "Your tears are like a fire that's burning our hearts and your belief in your dream and your resolve lead us all on the path to survival and success," wrote Mahmoud Hussein. Egyptians fear Salah may not recover in time to lead the Pharaohs in this summer's World Cup in Russia, just as he led them to qualification for the first time since 1990. Youth and Sports Minister Khaled Abdel-Aziz insisted Salah would be ready to play in two weeks. Egypt has been captivated by Salah since he moved to Liverpool from Rome last summer. His image is splashed almost daily on front pages of Egyptian newspapers, his games are watched by millions and his goals spark wild celebrations. He scored 44 goals in all competitions this season with Liverpool, a feat that shot the winger from a remote Nile Delta village to global stardom and earned him the deep gratitude of a nation fatigued by political turmoil, economic hardships and a long-running insurgency by Islamic militants. "To us Egyptians, Mohamed Salah is not just a footballer, he's everyone's dream," tweeted a fan on Saturday night. Amar Ali Hassan, a novelist and social science researcher, believes many of Egypt's youths see in Salah's success story a measure of compensation for their perceived failure to realize the goals — bread, freedom and social justice — of a stunning 2011 uprising that toppled autocrat Hosni Mubarak. He said that "Mohamed Salah proves Egyptians, when given the opportunity and right context, can be both successful and creative."